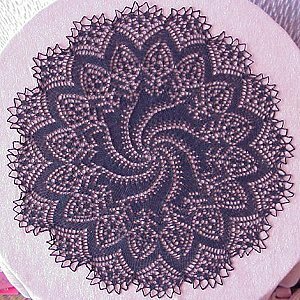 One of the most published and most modest lace knitters, Gene also has an extensive lace pattern collection. 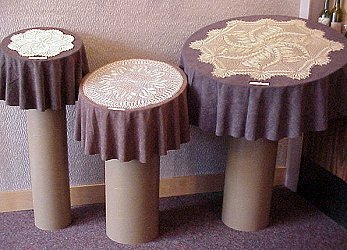 He started collecting patterns in the 40's and 50's when he and his family lived in California. Gene learned to knit from books at the age of about eight years. His mother was very busy with three boys and a husband to look after, so Gene began to read and collect knitting patterns. Once he tried lace he was hooked and has given up all other forms of knitting. 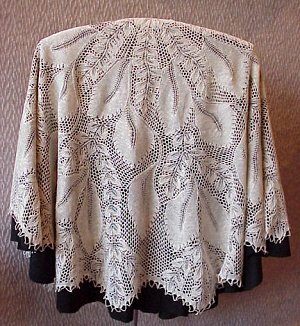 Now living in Oregon, Gene has lace patterns from Germany, Italy, France, Denmark as well as others in his collection. He especially enjoys the European patterns. Friends often contribute to his collection and in turn he generously shares patterns with others. To see more of Gene's work, see the five shawls/scarves in The Best of Knitters -- Shawls and Scarves (XRX-Inc publisher) and two shawls in Gathering of Lace (XRX-Inc). 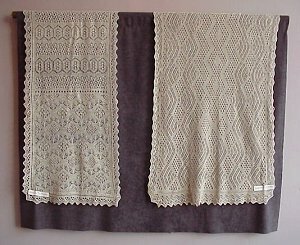 We have one large shawl and three lace pieces in this display. Note the intricate designs. Nino Esposito Nino's parents both came from Italy and he returns to Italy to visit his only relatives as often as possible. In his suitcase is his knitting gift for everyone, He just returned so we are lucky to have something from him in our exhibit. Nino's interest in knitting began with his teaching position when he recognized that the type of person in his 11th grade special education classes needed leisure time skills. He offered to teach in his spare time anyone in the building any craft they might be interested in learning. The interest came slowly, but increased with time. Although Nino knew nothing about needlework he purchased a dime store book on all types of needlework. Thus began his compulsion for needlework of all kinds. There was a time when he made all of his clothes including dress shirts, pants, and top coats. If the information that needlework is one of the best deterrents for Alzheimer's, Nino's knitting will continue full speed ahead. His projects so far this year (as of September 2001): numerous Shetland shawls, four or five lace center pieces, a raglan sweater, a Russian Wedding Ring shawl which took months to complete, about 5 pairs of socks, and his current work in progress, a Hap shawl. Did we mention he is now retired? And that he only enjoys things that are extremely difficult! During his teaching days Nino taught cooking and eventually was able to open a lunch restaurant two days a week for the teachers and any guests that wanted to come. The students did it all. He wanted to open a legitimate restaurant where students could be hired for training and when they were ready, assist in finding them positions in food service. Much to his dismay, the administration would not support such an adventurous idea. Now living a life of leisure where he knits and listens to all the music he loves (first degree was in music, then back to get certified in Special Education). Some of his former students are still enthusiastic and he often charts work for them in simple terms, using a chart system similar to the one the Japanese use for crochet. That system seems easiest for them to understand. His black lace centerpiece is shown here. Ted Myatt This Canadian grew up in a family of knitters (mother and grandmothers who knitted for the War Effort and many other charities). After learning as a child, it wasn't until he was going to university that he picked it up again. A friend showed him a method for making a raglan sweater in one piece from the top down. Although unremarkable now, it was quite daring 20-ish years ago. "Shortly afterwards I read about Elizabeth Zimmermann in the premiere issue of a magazine called "The Prairie Wool Companion", now transformed into 'Knitters' magazine". He got EZ's booklist, and she and Ted corresponded nearly weekly for about a year and a half. Ted likes knitting using just about every technique except double knitting and intarsia. He knits lots of socks because they are so portable and they can be used to knit just about any technique. He published a book of "Christmas Stockings" in 1994, intending to give novice knitters manageably-sized projects to practice techniques. The fascinating part of knitting for Ted is the challenge of seeing how things work. A lot of the knitting he does is purely experimental -- trying to refine a shaping or some little technical point. Working others' designs offers a study to see how others approach a technical challenge. He really likes lace, seeing how it works and finding it fascinating to knit. In answer to the favorite knitters question: Ted said "EZ, 'cause she started it all; Meg Swansen, 'cause she is so supportive of new designers; Joyce Williams and Lucy Neatby, 'cause they have such unique ways of translating the world into their knitting; Bob Powell, 'cause he has chutzpah; Sarah Swett, who is an amazing colourist; June Hemmons Hiatt, 'cause she knows so much and is so gentle in how she shares information; and Erica Heftman, who got me started thinking about spinning and dyeing." Currently a student at an information technology school in downtown Toronto, Ontario, Canada, Ted has been a licensed message therapist for 15 years, worked in retail sales, and taught jobsearch and resume writing skills. 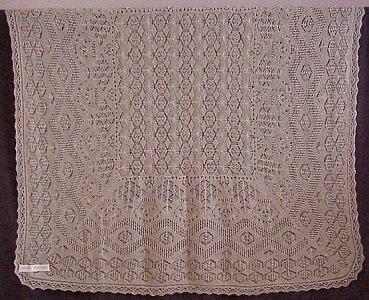 Ted's work: a 100% wool Shetland lace design by Hazel Carter (Madison, Wisconsin designer who also designs for Blackberry Ridge Woolen Mill in Mt. Horeb, WI www.blackberry-ridge.com); an Orenburg Lace shawl in silk/cashmere designed by Olga Fedorova; and a 50%wool/50%silk Shetland Lace Shawl he designed that was inspired by Terri DeHetre.